Don Henley will not take it easy when there’s a product being sold that references both his name and career with The Eagles, and now everyone knows: After filing a lawsuit against a Wisconsin clothing company that emailed an ad telling customers to “don a henley and take it easy” last October, the two sides have settled the case, with the company issuing an apology to both Henley and his fans for trying to be too clever. Duluth Trading Co. and Henley settled their dispute this week, with the clothing company issuing a long apology on its website for using the musician’s fame to peddle clothing without asking him first (h/t AdAge). Henley had accused Duluth of exploiting his name and connection to The Eagles’ hit song, saying customers might think he had endorsed the shirt. Duluth is also making a monetary donation to Henley’s non-profit organization Walden Wood Project, which aims to preserve the works of Henry David Thoreau. As many of you know, Duluth prides itself on not taking itself too seriously and this culture is often seen in our advertising, which we try and keep fresh, interesting, and funny. 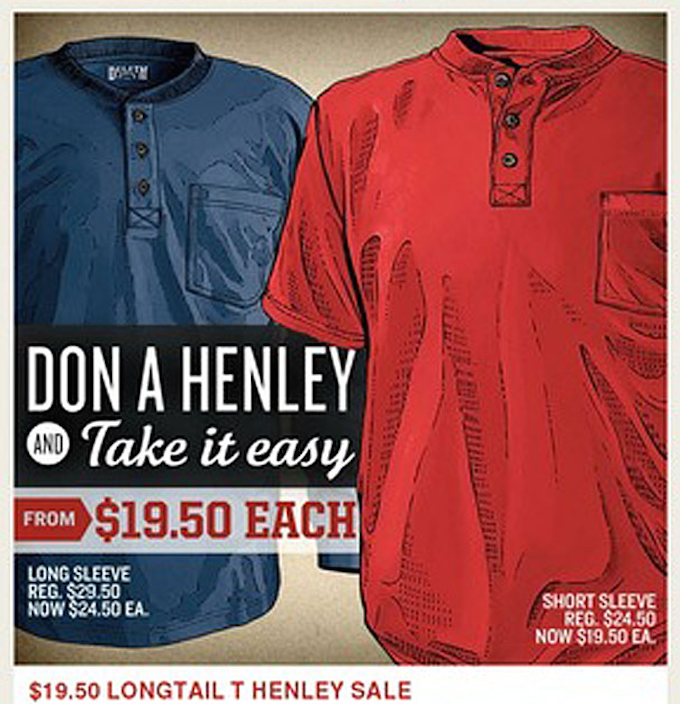 Unfortunately, we pushed the advertising envelope too far and distributed an advertisement promoting our line of Henley shirts that invoked American recording artist Don Henley’s name without his permission. Mr. Henley has long been an advocate of artists’ rights and he brought his objections to our attention. We appreciate and respect what Mr. Henley has meant to music and we now see that our use of his name and an Eagles’ song title in our advertisement was inappropriate. For that we are deeply regretful and we apologize, not just to Mr. Henley, but to anyone else who took offense. We have learned a valuable lesson and thank Mr. Henley for helping us appreciate the importance that he and other artists place in their publicity rights. We have, at Mr. Henley’s request, also made a monetary payment to be directed to the Walden Woods Project, in recognition of the 25th Anniversary of its founding, to resolve this matter.